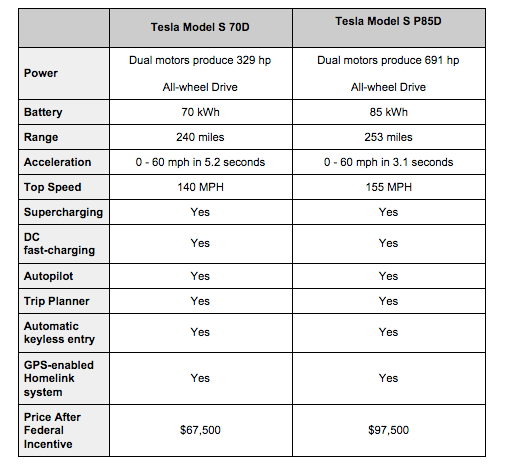 Great news for those who have been thinking of ordering a Tesla Model S! The California-based automaker just made an announcement about its new entry-level car — the Tesla Model 70D — with dual motors and all-wheel drive system, just like the Model S P85D. The new Tesla Model S 70D starts at $75,000 and qualifies for federal tax credit which lowers the price to $67,500 — therefore, your down payment will be incredibly reduced as well. And you can get further state incentives in the following states: Utah ($605), California ($2,500), Massachusetts ($2,500), Georgia ($5,000), or Colorado ($6,000). Test-drive is available today, click here to sign up. With the Tesla Model S 70D as a new entry-line model, the Tesla Model S 85 is officially retired, and all Model S cars are now featuring Dual Motors and All-Wheel Drive as standard.